This printable card game isn’t your usual Hearts Card Game. Typically Hearts revolves around winning tricks. In a trick, everyone takes turns playing one card. Whoever plays the highest card in the suit led (the suit of the first card played) picks up all the cards played. In Hearts, you want to gain the lowest amount of points possible. Whoever has the fewest points at the end wins. The cards that are worth points are the Hearts (worth 1 point each, regardless of value) and the Queen of Spades is worth 13 points by all by itself. While a fun card game, we have own own take on this card game! 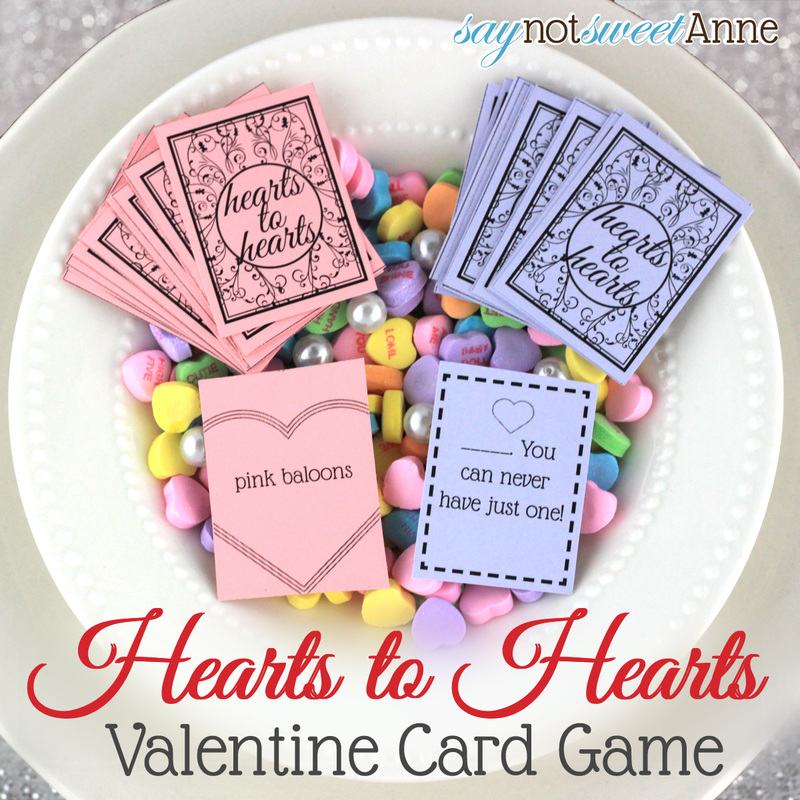 This Heart to Hearts game plays just like the popular game Apples to Apples and is a perfect easy card game for kids. Basically, there are two decks. Each player draws several cards from the “answers” deck. Then, when it’s a player’s turn they draw a card from the “questions” deck and pose that question to the group. The group must answer with one of the answer cards in their deck- hoping to be the most correct out of the bunch. Usually though, the answers and questions don’t quite match up and they are hilarious! We all know that Valentine’s day usually means a bunch of candy. 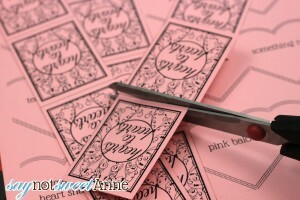 More and more children’s parties, classroom activities and family play time revolves around something sticky and sweet. Well, not for me this year!! This hearts card game is a great kid-friendly game that is easy on the pocketbook, and easy to make. 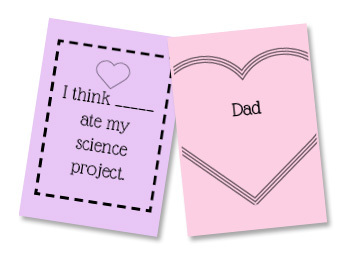 Also, there are a few blank “question” cards in the printable, so if you’re working on vocabulary words with your kids, or if you want to use pet’s names, or favorite toys in a question- just write those in! I love this cute little game, its light weight, doesn’t cost a fortune to buy, print or assemble, and its adorable! You’ll have loads of fun playing this little phrase game, and I hope it brightens your day! 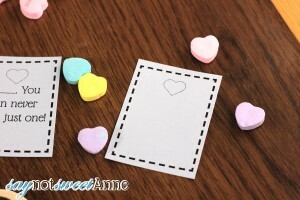 It would be a huge hit at a classroom Valentine’s Day Party! Conversation Hearts BINGO is another awesome Valentines Day game. Kayla is from Say Not Sweet Anne. 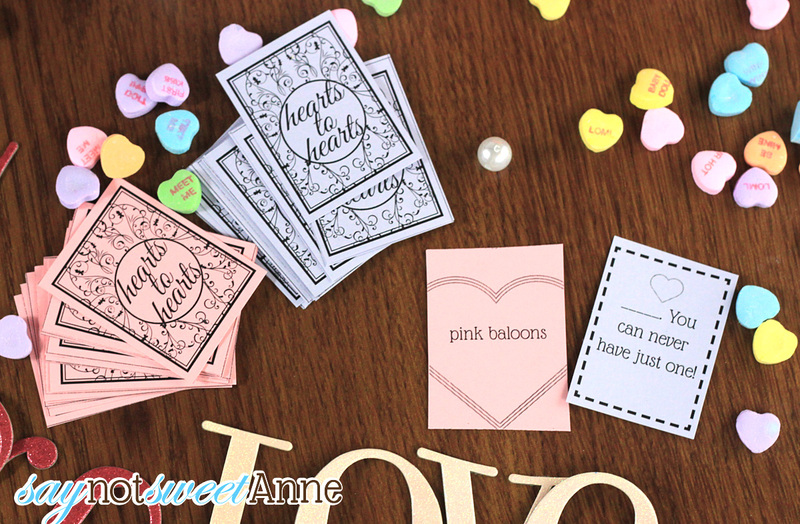 Her blog covers an array of fun things like crafts, recipes, and LOTS of printables. 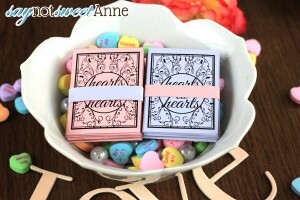 Visit her at SayNotSweetAnne.com! Don’t miss all the other fun printable Valentines here at Skip to my Lou. Thanks for this cute game. My church group is going to make the game for kids in the hospital and kids in group homes. Do you have anything for Easter? Thank you for this fun game! We had a great time playing it for our Valentine's Family Fun Night. Thank you! Cute game but unable to get back and fronts to line up. Any suggestions?? I am not sure what your issue is? Can you explain a little more? Backs and fronts? I will be printing this one! Thanks!